Town of Wallkill – Coming in from the afternoon sun, it took a minute for the eyes to adjust. What came into focus was all things related to the sharp and shooting, laid out in row after row in the low-lit pavilion at the Orange County Fairgrounds. 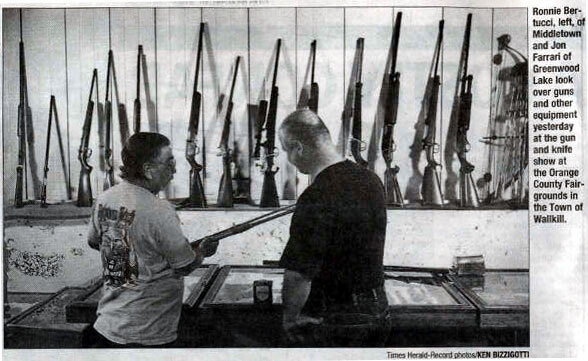 “Some brand-new guns,” of rows of rifles and pistols. “Some ammunition,” of boxes of bullets, including 50-caliber tracer bullets, if you happen to own such a huge rifle. Some bayonets. Some airguns. Some holsters and scopes and ammo clips. Some middle-aged men pointed rifles to the ceiling, right eye to the sights. “There’s the NRA to my left,” Chittenden said walking by a registration booth with a dry-erase board that read: More than 80 million gun owners in America. Only 4 million NRA members. Sign up here. And some “militaria” – medals and patches from past wars and armies. Nazi knickknacks, it seems, were popular. It’s been 21 years since Chittenden started with gun shows. He was a dealer, and on slow days he noticed something that would change his career: He might sell nothing, but the guy charging admission always got paid. “Every time somebody walks in the place, he’s making money,” Chittenden said. So he became that guy, and now puts on about 15 gun shows a year in the Northeast. And so he makes money on every guy – and they were mostly guys – that walked in from the bright afternoon sun yesterday.